^ 1.00 1.01 1.02 1.03 1.04 1.05 1.06 1.07 1.08 1.09 1.10 1.11 1.12 1.13 Central Pacific Hurricane Center. 2006 Tropical Cyclones Central North Pacific. 2007 [2016-03-18]. （原始内容存档于2016-03-06）. ^ Matsuda. Tropical Depression One-C Discussion One. Central Pacific Hurricane Center. 2006 [2016-03-18]. （原始内容存档于2015-02-01）. ^ Central Pacific Hurricane Center. Tropical Storm Ioke Discussion Number 2. National Oceanic and Atmospheric Administration. 2005-08-03 [2016-03-18]. （原始内容存档于2016-03-03）. ^ Nash. Tropical Storm Ioke Discussion Four. Central Pacific Hurricane Season. 2006 [2016-03-18]. （原始内容存档于2016-03-03）. ^ Houston. Hurricane Ioke Discussion Seven. Central Pacific Hurricane Season. 2006 [2016-03-18]. （原始内容存档于2016-03-03）. ^ Browning. Hurricane Ioke Discussion Twelve. Central Pacific Hurricane Season. 2006 [2016-03-18]. （原始内容存档于2016-03-03）. ^ Donaldson. Hurricane Ioke Discussion Thirteen. Central Pacific Hurricane Season. 2006 [2016-03-18]. （原始内容存档于2013-12-20）. ^ Kodama. Hurricane Ioke Discussion Twenty. Central Pacific Hurricane Season. 2006 [2016-03-18]. （原始内容存档于2016-03-03）. ^ Burke. Hurricane Ioke Discussion Twenty-Five. Central Pacific Hurricane Season. 2006 [2016-03-18]. （原始内容存档于2016-03-03）. ^ 10.0 10.1 Browning. Hurricane Ioke Discussion Twenty-Six. Central Pacific Hurricane Season. 2006 [2016-03-18]. （原始内容存档于2016-03-03）. ^ Geophysical Fluid Dynamics Laboratory. 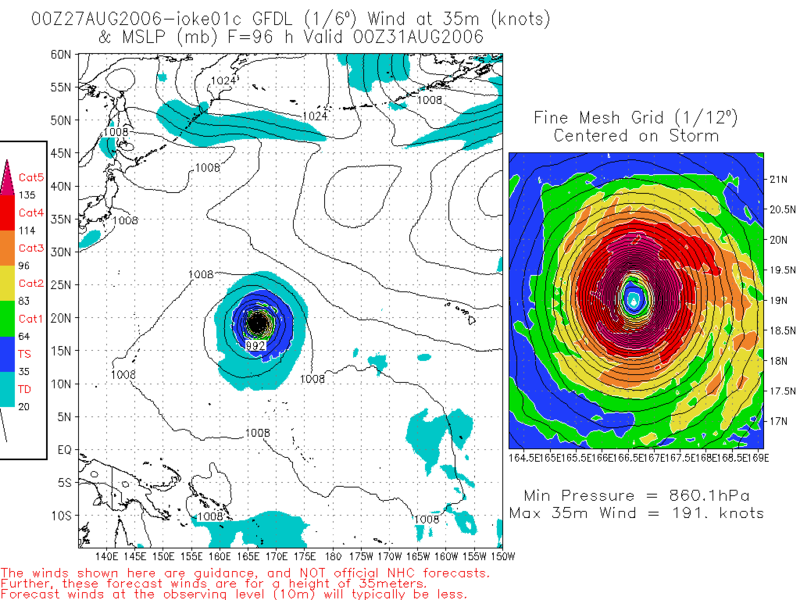 GFDL Hurricane Ioke Prediction: 2006-08-31 00z (PNG). NOAA. 2006 [2016-03-18]. （原始内容存档于2016-03-03） –通过Photobucket. ^ 12.0 12.1 12.2 12.3 Joint Typhoon Warning Center. Super Typhoon 01C. 2007 [2011-06-07]. （原始内容存档于2011-06-07）. ^ Alpha Forecast Team. Typhoon Ioke Prognostic Reasoning NR 033. Joint Typhoon Warning Center. 2006. ^ 14.0 14.1 Japan Meteorological Agency. 2006 Western North Pacific Tropical Cyclones Best Track. 2006 [2011-07-09]. （原始内容存档于2011-07-09）. ^ Bravo Forecast Team. Typhoon Ioke Prognostic Reasoning NR 051. Joint Typhoon Warning Center. 2006. ^ Charlie Forecast Team. Typhoon Ioke Prognostic Reasoning NR 055. Joint Typhoon Warning Center. 2006. ^ Hendricks. Typhoon Ioke (01C) Advisory Number 56. Guam National Weather Service. 2006 [2016-03-18]. （原始内容存档于2016-03-04）. ^ Delta Forecast Team. Typhoon Ioke Prognostic Reasoning NR 061. Joint Typhoon Warning Center. 2006. ^ George P. Bancroft. Marine Weather Review—North Pacific Area September through December 2006. NOAA National Center for Environmental Prediction. 2007 [2016-03-18]. （原始内容存档于2013-02-22）. ^ Office of the Federal Coordinator for Meteorology. Actions and Recommendations for the 61st Interdepartmental Hurricane Conference (PDF): 115. 2007 [2016-03-18]. （原始内容 (PDF)存档于2016-03-03）. ^ Kodama; Ballard. Hurricane Ioke Public Advisory Eight. Central Pacific Hurricane Center. 2006 [2016-03-18]. （原始内容存档于2016-03-03）. ^ Leone, Diana. Hawaiian-named storm hits Johnston Isle. Star Bulletin. 2006-08-23 [2016-03-18]. （原始内容存档于2015-09-12）. ^ Andrew Leonhard. Wake evacuated -- Airmen airlift 188 from Pacific Island. Air Force Print News. 2006-08-29 [2012-10-14]. （原始内容存档于2012-10-14）. ^ Wake Island evacuated as Super Typhoon Ioke closes in. Anchorage Daily News. Associated press. 2006 [2008-05-28]. （原始内容存档于2008-05-28）. ^ 25.0 25.1 Gary Padgett. Tropical Cyclone Summary for August 2006. 2006 [2016-03-18]. （原始内容存档于2012-02-19）. ^ Chris Vadnais. Teams fly to Wake Island to assess damage. Air Force Print News. 2006-09-13 [2012-10-17]. （原始内容存档于2012-10-17）. ^ 28.0 28.1 28.2 Rob Tebben. Ioke on Wake Island (PDF). Air Force Weather Observer. 2006 [2013-02-16]. （原始内容 (PDF)存档于2013-02-16）. ^ Chris Vadnais. Airmen piece together Wake Island connectivity puzzle. Air Force Print News. 2006-09-17 [2012-10-18]. （原始内容存档于2012-10-18）. ^ 30.0 30.1 Chris Vadnais. Airmen Add Up Damage at Wake Island. Air Force Print News. 2006-09-15 [2014-12-20]. （原始内容存档于2014-12-20）. ^ Advisory Council for Historic Preservation. Spring 2007 Case Digest — Protecting Historic Properties (PDF): 17. 2007 [2016-03-18]. （原始内容 (PDF)存档于2015-07-15）. ^ Japan Meteorological Agency. Evacuation of Minami Torishima during Typhoon Ioke. 2006 [2016-03-18]. （原始内容存档于2016-03-03）. ^ Japan Meteorological Agency. About Weather Observation Reopening of the South Torishima Meteorological Observing Station. 2006 [2016-03-19]. （原始内容存档于2016-03-04）. ^ National Climatic Data Center. Event Report for Alaska. 2006 [2009-07-28]. （原始内容存档于2009-07-28）. ^ National Climatic Data Center. Event Report for Alaska (2). 2006 [2008-05-30]. （原始内容存档于2008-05-30）. ^ Cattle Network. National Weather early for September 2006. 2006 [2009-07-27]. （原始内容存档于2009-07-27）. ^ Hurricane Research Division. 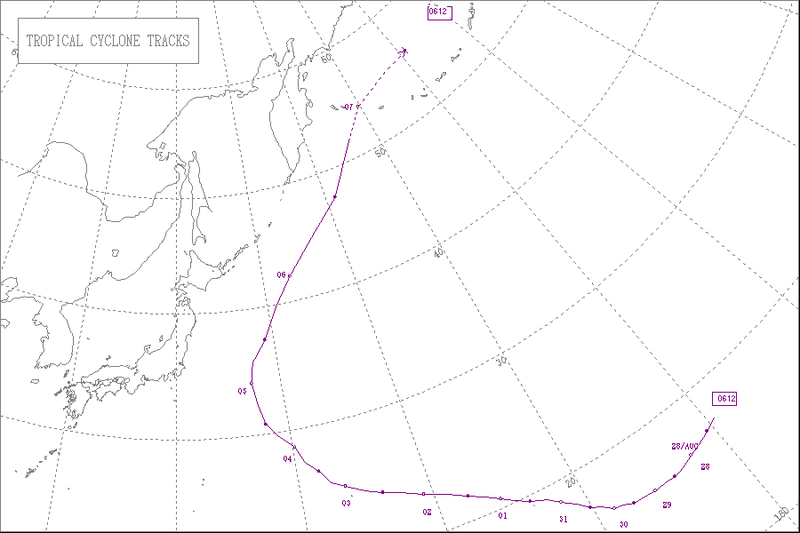 Northeast Pacific Ocean Tropical Cyclone Best Track. NOAA. 2007 [2016-03-19]. （原始内容存档于2016-03-03）. ^ Mark Saunders; Adam Lea. Summary of 2006 NW Pacific Typhoon Season and Verification of Authors’ Seasonal Forecasts (PDF). Tropical Storm Risk. 2007 [2016-03-19]. （原始内容 (PDF)存档于2016-03-03）. ^ Chris Johnson. In the Wake of Ioki. U.S. Military. 2006 [2016-03-19]. （原始内容存档于2016-03-03）. ^ Chris Vadnais. Power pros 'wire' Wake Island. Air Force Print News. 2006-09-20 [2008-09-11]. （原始内容存档于2008-09-11）.